In total there are 27 of these with lava, water, and poison swamp. I also included some variants in the zip file. These are slightly raised so they have a different look. Also in there are the templates that I used, for those of you who want to do similar things with Samurai, Arabian Nights, etc sets. 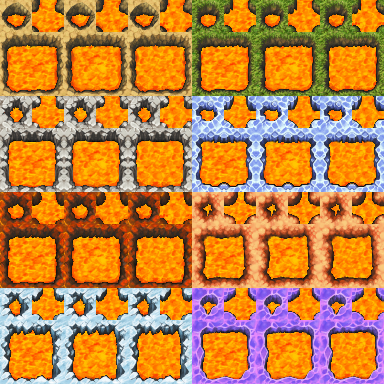 Here is the icons put on tilesets for people who could think of a possible use for such a thing. These are shrank to fit on the screen a lot better, but you need to click on them before you save them, so they will be the right size. 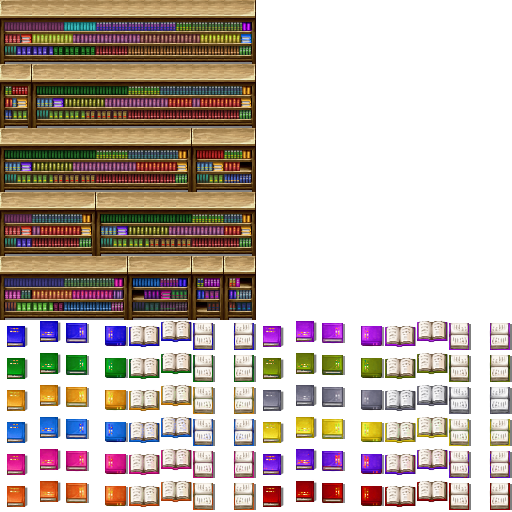 If you’ll notice a lot of the bookshelves have really similar patterns and I wanted to vary that up a bit, but that takes a while also I think a couple are the RTP bookshelves and I intend to change that, plus I wanted to have an alternate color for the bookshelves that would go next to the others. The books on the bottom should all be good. One of the problems with recoloring the books using GIMP is that the open pages get all screwed up. So I had to create this template to overlay on the open pages you can use this if you want to make your own colors and want to fix the pages with less hassle. I have question to you. In which license you share these graphics? 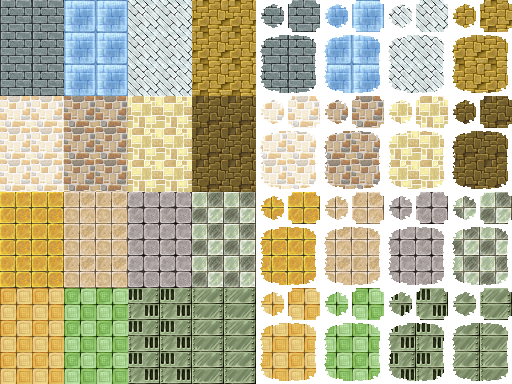 These (and most of the things I make in general) are all based on RPG Maker Ace graphics and if you have the license for that you can use these. I myself allow people to use my work for both commercial and non-commercial games for no charge, but (and yes I stole the idea from Yanfly) if you make a commercial game a free copy of the game would be appreciated.